All the pictures are wonderful, every one of those little blooms pushing themselves out into the mercurial air ... but I have a particular soft spot for the lavender. I don't know why. I love it. Something tells me you'll treat us to some lush winter pictures, too! You've got a good assortment of things still blooming. I think I need Salvia 'Caradonna.' My Ceratostigma stopped blooming a while ago, but the foliage is such a great red now, it makes up for it. I decided to get my post done early too, as the forecast for tomorrow is highs in the mid-30s with possible snow. Ugh! That's a great showing of blooms for November for the midwest. Those blooms just hang on, until the bitter end, don't they? And just like there, the bitter end here is probably tomorrow. My post will be out just after midnight. Thanks for joining in and for sharing your garden with us once again. Mr McGregor's Daughter, I had noticed your comment on the hardy blue plumbago. Mine hasn't been a great performer, but I love the red foliage, too--especially when it overlaps with the blue blooms, although admittedly that only happens for about a week here. Dearest Joey, don't feel bad--I still have orphan bulbs, too! I got the garlic planted today finally, but I believe that I'll be forcing the few tulips and daffodils that I'm still going to be buying, instead of planting them outside. A lovely display considering it's November already. My favourite is your native honeysuckle, what a showstopper that one is. Last year I hasd snapdragons flowering till early February. I'm curious how long yours will last. I am impressed by all the blooms Kim. I don't think there is a thing blooming in my garden. It has rained the last three days so I haven't really been out. I can see the honeysuckle fromt he kitchen door and I don't have any blooms. This is also one of my favorite plants. Looking at your post, I never would have guessed that you are near Lake Erie, so I am glad you mentioned the Lake Effect. I live at the Southern end of the Chesapeake Bay and enjoy similar effects. I specifically wanted to stop by to say thank you for posting how to use the HTML codes (in the Bloom Day comment section at May Dreams Gardens). It was a great tip that I have committed to paper for future use. I am totally out of blooms...well, outside at least! I love Euphorbias and I will make a note of that one for future garden spots. Loved your Halloween decorations! Poor skeleton with that disease called 'Cabbage crotch' made me laugh. Happy B'Day to your Mom. My Mom's is actually today! I am going to have to wait until this evening and tomorrow to look at all the GBBD blogs, but I wanted to look at yours before getting ready for my day. We grow a lot of the same things, but my cold weather has ended most of the blooms. 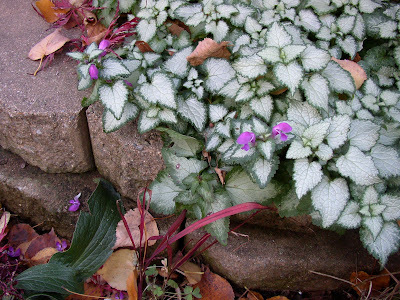 I am tempted to go out to look at my lamium and a couple other plants to see if there are any blooms I missed, though. I had a picture similar to yours of snapdragons, that I accidently left out. 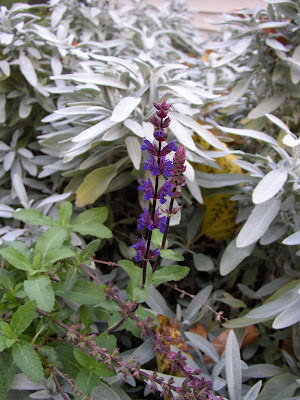 I love the salvia and sage in your first picture. Thanks for your help in telling us how to make links to our GBBD blogs! I see some have used the information. Good for you, Kim, to have found some many lingering blooms! 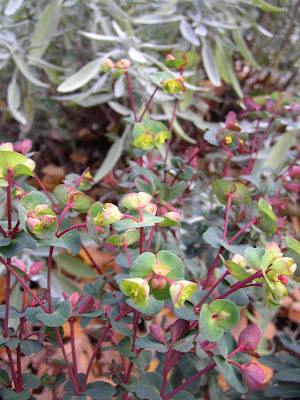 That euphorbia is absolutely stunning, and the culinary sage cultivar in your first photo is a beauty too. And that honeysuckle - wow! I'd also like to second Les in thanking you for the tip on how to post a hyperlink in a comment over at Carol's site. You are still enjoying some blooms. 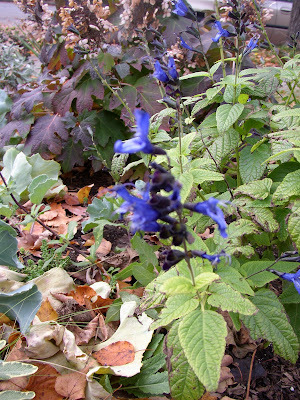 I love the Blue/Black Salvia it's on my list for next spring. I like that vine the red one, does it grow fast? I'm lucky to have my C.plumbaginoides still in full bloom (does your's self sows itself?). I've never seen tha Lonicera around here, but would be a plant I would most likely buy, it looks great! More on the list! The euphorbia has always been an attractive plant but I think it needs sharper drainage and much more sun then we have here...but it is staying on the list! I love all the purples in autumn how beautiful they look next to silver and gold leaves! 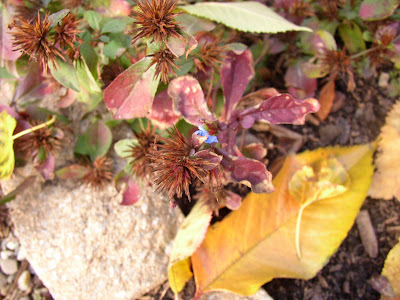 Black and Blue continues to amaze me with it's frost tolerance and stunning color...maybe it will seed in your garden. I hope you are keeping warm! Winter is heading our way...temps in the mid twenties! I love the contrast of the purple against the silver. Lovely blooms! Great variety! 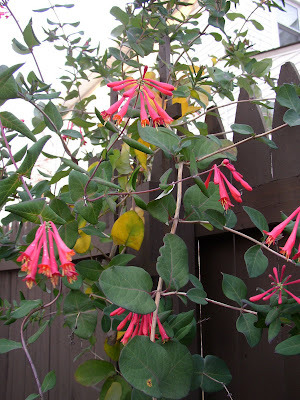 I love the honeysuckle vine. I'm pretty sure it will grow here.-) And I like the black and blue salvia. I forgot that I planted one recently. Thanks for the information on the garlic. Yolanda Elizabet, thanks! 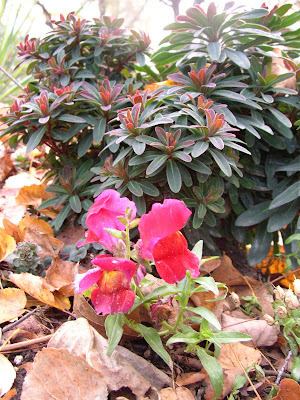 If we have snapdragons much past Thanksgiving, it will be a very very very warm start to winter here. In fact, if we have them much past this week, I will be very surprised--this coming week, overnight temperatures are forecast to be in the upper 20s! Greenbow Lisa, huh. I wonder why my honeysuckle is blooming away but yours isn't? Interesting... maybe it's just being nice to me since this is its first full year at my house?! Either way, I'll take it. Les, no problem. I know some basic HTML coding from my "day job," but there are a few good informational sites out there, too, so if you want to know something specific you could always google what you want to do and figure it out this way. 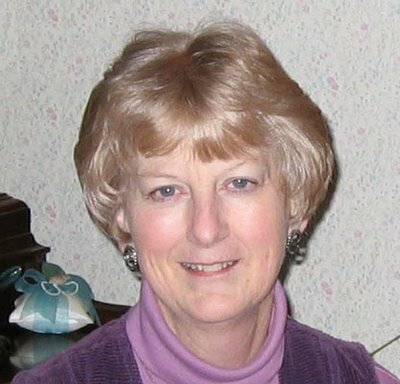 Hi Sue! You know, I missed my lamium blooms at first, too. Then I noticed one on the 'Anniversary'/'Anne Greenaway' lamium (which, oops, I forgot to list) as I walked by after taking pics of the blue plumbago... and when I looked again at the 'Purple Dragon' sure enough, I found one there, too. It's so easy to miss them since I grow the plants more for the foliage, and since the blooms are so small! Nan Ondra, I had to catalog them, because most of them will probably be frozen out tomorrow! lol. The 'Newe Ya'ar' culinary sage is such a pretty silver, and has such a good compact growth habit (not to mention a great taste) that I really think I'm going to go ahead and take out all of my regular culinary sage and just keep this one from now on. gintoino, you certainly should! 'Caradonna' really blooms for me as long as 'Mainacht' with the same occasional/lazy cutting back that I am wont to do for both... and the flower stems are dark purple, which makes the flowers seem that much more dramatic. By the way, I haven't noticed my c. plumbaginoides reseeding, but I may have clipped it back last fall. So I'll keep an eye out next spring and let you know. 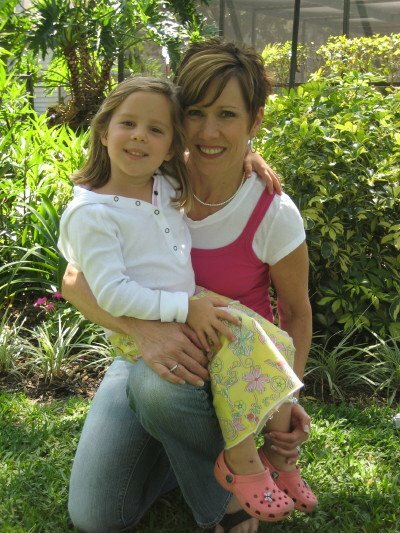 Gail, that may be true about the euphorbia and the drainage, but I know that Kylee at Our Little Acre grows some euphorbias over in what was once the Great Black Swamp... and if her ground is anything close to what my parents have, it's very heavy soil! Also, I had some luck at my old house (which was just south of here, in heavy clay that was often wet) planting things like lavender at the top of mounds of well-draining dirt. Seemed to work best when things were hardy to a zone colder than mine, though. Hi Kim, you still have lots of things that have bit the dust here, like the honeysuckle, but I see you are benefitting from the lake effect, lucky you! I love caradonna and am worried that I killed it with an untimely division while the weather was still warm, shame on me. And black and blue, and coleus,, still hanging on, amazing. I wanted to tell you that I did add some culinary sages, tri color, to my little leaf syndrome bed by the yellow/white garden. I love the look and would have never thought of them on my own. Thanks for inspiration! Kim, lots of lovely blooms still showing here, and in some of my favorite colors. Don't apologize for your "millionth" photo of the first salvia. I have some "Victoria Blue" that I've shown about that many times, too:) When a plant performs well, you just can't help bragging about it. Thanks for the info about how Lake Erie affects your weather--I wondered how you could have so many blooms unaffected by the cold. Yes, Katarina, it is definitely nice to have so many in November. Since today it's snowing (although not sticking) I'm sure that some of these will bite the dust fairly quickly, unfortunately! Frances, I think that 'Caradonna' is a pretty tough customer, so I'm holding out hope that you'll have it come back. I had some babies sprout up where I didn't get all of the roots when I moved my first few to a new place, so that should give you some hope! By the way, I am enjoying the Lake Effect right now... but I will admit that come spring, I probably will be whining about it again. As in, "WHY are all of the daffodils at work in bloom, when all of mine up north barely have buds? Darn lake!" lol. I overwinter my silver and 'Cerveza 'n Lime' plectranthus in the house, too. And the flowering stuff I showed in that picture when I mentioned the plectranthus (the "dogbane" coleus) would need to be overwintered here, too... but I decided not to bother with it, even though the flowers are cool. Because the leaves stink VERY STRONGLY of skunk! Interestingly, that's why it's supposed to repel dogs and cats... but I can't figure that one out. Seeing as how my dog seeks out things that are gross and nasty to roll in, I can't see why the skunk smell would repel her at all! lol. That coleus is one of my faves even though it does smell like skunk and I'm sorry we don't have any in the garden right now! And I love the euphorbia - the world (Blithewold, I mean) needs more euphorbs! Reading your answer to the last comment makes me think that my plan to plant Stinky Coleus along the hedge - to keep my dog from busting through to the neighbor's yard - won't work... Is Coco really attracted to rather than repelled by The Stinky? You really have a lot more than me and I supposedly enjoy those Lake Erie benefits as well! 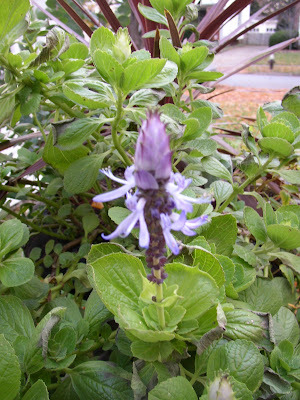 I see many other shave th eBlack and Blue sage--I planted it, but haven't had much luck. I am a big fan of the euphorbia as well. Kris, I really do like that coleus for the funky flowers and the succulent-looking leaves... but WOW the smell travels! lol. Coco doesn't really seem to think about The Stinky one way or another, and has limited interaction with it because it's in the urn planter. She does like to roll in things like dead fish, though, so I don't know that this would really phase her... but it would be interesting to see if it keeps your dog in! EAL, huh. I wonder if the brutal winds that you guys get (we're spared a little bit of that here on the west side of Cleveland--the east side gets the brunt of our winds) somehow negates that Lake Effect for you? Hi Kim, I do love the contrast in that first photo... I always favor any plant with striking foliage as it comes in handy around here with all my shade. Isn't it nice to have the water keep your temps down (or I guess that would be up a bit) a bit for the few extra weeks? We live close enough to the coast to have more tropical temps than even the next county over. I like it that way. I'm particularly fond of your 'Purple Dragon' dead nettle if it's the one with the silvery heart-shaped leaves and dark green edges. Very striking. 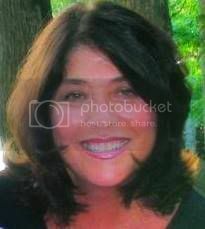 Go to www.floridata.com and type in firebush and you will get all the info you want. This is my first year with it so I cannot pass on too much first hand knowledge, other then it has been a wonderful bloomer and fast grower. The Lake Erie effect has given you such a royal GBBD, Kim! All that silver and purple is just lovely. 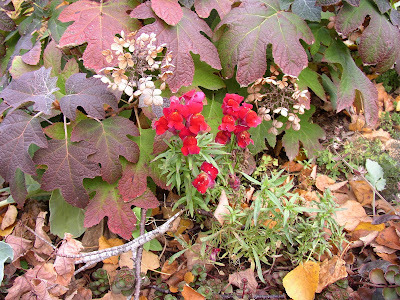 I also loved the contrast of fall-turned Oakleaf Hydrangea & red snapdragons. Meems, I'm with you--any kind of striking foliage really catches my attention. I need to learn to use the most colorful selections in swaths more, like you do, to keep my garden from looking too "bitty." And yes, 'Purple Dragon' is the groundcover with the silvery heart-shaped leaves... and best of all (in my non-tropical climate) it's evergreen! 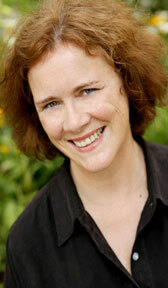 Annie, oooh... this is why you write such beautiful posts. You notice things like the silver+purple=a royal GBBD! :) Thanks again for turning me on to that honeysuckle. It's lived up to my expectations and then some, that's for sure! Wow! I'm surprised to see this kind of color in mid-November up your way. I wasn't familiar with the dogbane coleus - it looks quite interesting (and happy!) - do you plant the plectranthus each year as an annual? Each pretty much an annual here too - I've tried to mulch it so that it would come bounce back in the spring, but it hasn't happened yet. 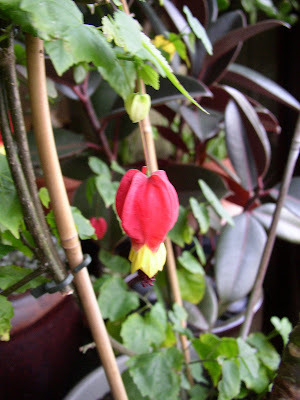 Oh - and that Abutilon is beautiful - I have two in the ground, but not that one. I've always admired it. Hope you catch up on your work! And if I could send you a white camellia that is cold-hardy, I would. Look at that 'Efanthia'!! You know I'm jealous, don't you? LOL. Maybe I'll try it again next year. I noticed the same thing here, that different things were blooming this year than last. My Plumbago looks exactly like yours, except mine doesn't have seedpods. I only planted them this fall, maybe that's why. But it has some minute blooms, too. I forgot to mention them in my Bloom Day post. I hear you have snow up there now. We still don't, but I have a feeling that's about to change this weekend. Let me know when we can get together over Thanksgiving! You had some lovely late-blooming blues, Kim...several I want to try...like more salvias next year for sure! That euphorbia is really lovely. I have a similar unnamed one that overwinters in the garden here. 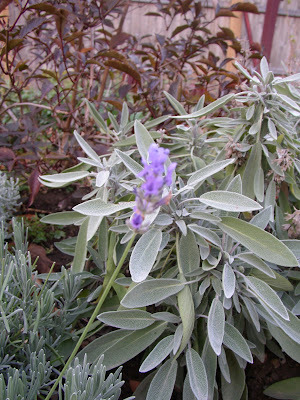 I love the silver of the 'Newe Ya'ar' sage, especially with the Caradonna salvia. A friend gave me a start of an unnamed honeysuckle which may be the same as yours. Would yours be hardy here in our zone 5? Thanks for the info on the Knock Out roses :) I'm going to have to try them! The azalea has red-orange blooms. Yes, the foliage in fall is gorgeous! You sure had a nice Bloom Day! I actually missed this one entirely (my body has been waging war upon me :(, but my blooms were sparse anyhow.